SEOUL, South Korea (AP) — With the much anticipated summit between North Korean leader Kim Jong Un and South Korean President Moon Jae-in now ready for the history books, Kim's foray into the world of globe-trotting diplomacy moves on to his next high-profile appointment — with President Donald Trump. But before it gets lost in the rearview mirror, it's worth remembering that Friday's daylong summit inside the Demilitarized Zone that divides the North and South was quite an event in its own right. Despite being the center of an intense cult of personality and a constant presence on North Korean television and in newspapers, Kim Jong Un got a lot more exposure than ever before when he crossed over into South Korea, where nearly 3,000 journalists had registered to cover the summit. Key parts of the event were broadcast live — another rarity for Kim — providing the South with its first really good, unvarnished look at the North Korean leader. They saw glimpses of a very heavy young man out of breath as he signed a guestbook after walking with Moon. They also saw him red-faced at a banquet, likely from the ample beverages available. But some of the most striking images were simply of Kim's seeming ease and confidence as he navigated the situation — and his quick and frequent smiles. For good measure, he even brought his wife — a former singer who is also quite comfortable in the public eye — and his younger sister, who is his closest confidante and was on hand at almost every turn to hand him statements to sign, adjust his chair and generally look out for her older brother. Moon made sure the summit would be a tremendously visual display of Korean reconciliation. The South planned everything the two leaders would do, right down to the last detail, from the initial handshake over the line that divides their countries to the goodbye light show and concert Moon hosted as Kim's final send-off. The summit, held on the south side of the DMZ, was filled with such moments, but also allowed enough room for others that perhaps were unscripted, including Kim taking Moon's hand and stepping together with him over the dividing line and, briefly, back into the North. 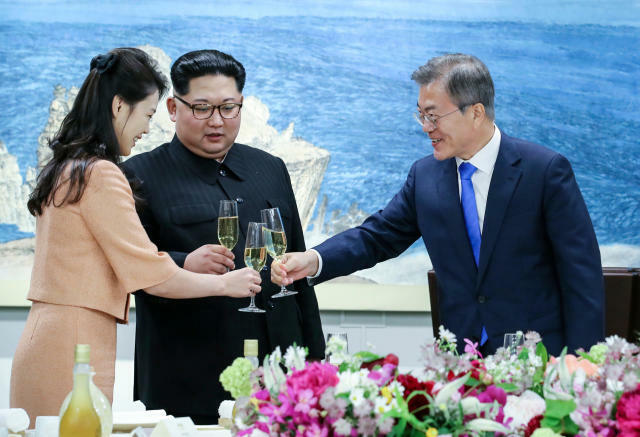 Both leaders announced that Kim will fete Moon in Pyongyang in the fall. For all its theatrics and hitting every emotional beat, Moon's summit extravaganza will certainly be a hard act to follow. Kim now has two major summits under his belt — he met with Chinese President Xi Jinping last month in Beijing — and he sailed through both without pinning himself down with any substantive promises about what he plans to do with his nuclear weapons. Xi and Moon let that slide, but it's going to be a problem for Trump, who has made statements that seem to bet the farm on a deal for Kim to quickly and irreversibly denuclearize. Trump and Kim have yet to even set a place or a date to meet, though they are aiming for late May or early June, and Trump has stated that if he doesn't believe the talks are fruitful, he'll call them off or get up and leave. Meeting with the president of the United States, his country's archenemy, is also a different ballgame for Kim. China is a traditional ally, even if relations are often bumpy, and in South Korea he is at least with fellow Koreans who share a language and culture. Trump will be as much of a wild card to Kim as Kim is to Trump.